We have new puppies born to Stowes Miss Mercedes and Inedabullys Thats My Kid By Million (CHAPS). 3 Boys and 1 Female. I am not posting pictures of the female at this time. SOLD-SOLD Going to his forever home with the McNeil family in Harrisburg SD. SOLD SOLD SOLD Bo has sold and has went to his forever home in Bakersfield California with the Waugh family. SOLD SOLD SOLD Sampson has sold and has went to his forever home in Nixa Missouri . SOLD-SOLD Sailor has sold and will going to his forever home with the Johns family in ElberField IN. FERNANDEZ'S LAYLA AND CHAPS HAD 5 BEAUTIFUL PUPPIES ON FEBRUARY 17, 2018. 1 MALE AND 4 FEMALES. SOLD SOLD FEMALE PUPPY HOPE HAS SOLD. HOPE'S NEW FAMILY ARE ENGLISH BULLDOG LOVERS. HOPE'S FOREVER FAMILY IS THE SUSIE GIBSON FAMILY FROM KANSAS CITY MO. HOPE WILL BE JOINING A 9 YEAR OLD FEMALE ENGLISH BULLDOG. SOLD SOLD--MALE PUPPY THOR HAS SOLD. HIS FOREVER FAMILY IS THE YOUNG FAMILY FROM MONTICELLO INDIANA..
SOLD SOLD--FEMALE DAZZLE HAS FOUND HER FOREVER HOME WITH THE KATIE STINSON FAMILY IN HANOVERTON OHIO. SOLD SOLD--FEMALE PUPPY FAITH HAS FOUND HER FOREVER FAMILY WITH THE WAUGH FAMILY IN BAKERSFIELD CALIFORNIA. STOWE'S MISS DOTTIE HAD 4 BEAUTIFUL PUPPIES JANUARY 28, 2018. 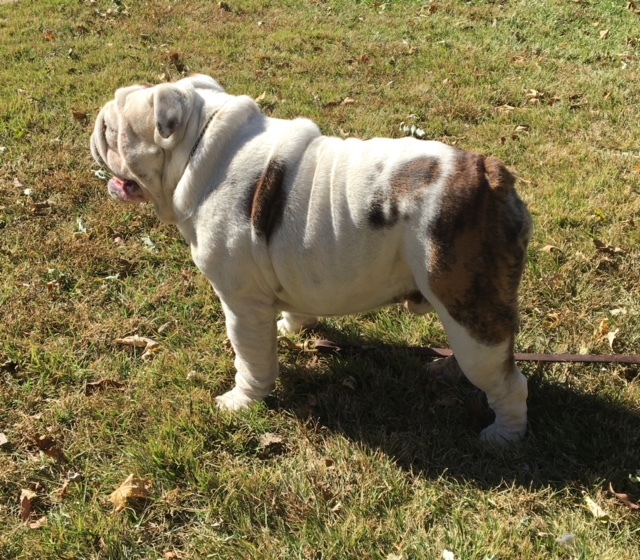 SOLD SOLD ROLLY MALE IS SOLD AND WILL BE GOING TO HIS FOREVER HOME WITH THE WELLS FAMILY IN FAIR GROVE MISSOURI. SOLD SOLD PONDS MALE PUPPY HAS SOLD AND WENT TO HIS FOREVER HOME. HIS NEW OWNERS ARE THE BOB WALSH FAMILY. SOLD SOLD POAKA DOT FEMALE IS SOLD AND WILL BE GOING TO HER FOREVER HOME IN PENNSYLVANIA. HIS NEW OWNERS ARE THE LAWRENCE FAMILY. SOLD SOLD PICKA FEMALE HAS SOLD AND WILL BE GOING TO HER FOREVER FAMILY IN PORTLAND OREGON. HER NEW OWNERS ARE THE DARWIN FAMILY. Text and photos copyright © 2010 Stowe's Bullie Babies. All rights reserved. Copying photos without written permission is a violation of federal copyright laws.